The story of the rivalry between the two most renowned actresses of the 19th century—legendary Sarah Bernhardt, whose eccentricity on and off the stage made her the original diva, and mystical Eleonora Duse, who broke all the rules to popularize the natural style of acting we celebrate today. Playing to the Gods is compelling enough due to the story it tells, but Rader goes the extra mile; not only does he capture the details of each woman’s performative life, but he also mines the personal as well. Excerpts from correspondence, bits of juicy gossip, tales of affairs and exploits romantic and otherwise—it’s all here, all of it capturing a vivid snapshot of the mutual orbit held together by the gravity of these binary stars. Both women were larger than life—one from the inside out, the other from the outside in. Lovers of theater and theater history will devour this book, an entertaining and immaculate look at a time that in many ways served as the primordial beginnings of the modern stage. 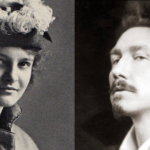 Playing to the Gods argues that the Duse-Bernhardt rivalry, dragging on for years, was more than just personal, it was crucial to the art of modern acting ... this book is better read as biography (the lives practically tell themselves) than as cultural history ... I wish Mr. Rader had explained why 19th-century audiences had such an appetite for female anguish. Instead, he ticks off the hardships the women experienced to get to their virtuosic portrayals of agony ... For students of #MeToo, there’s plenty to think about in this book. Many of the aristocratic cads these actresses took up with sound like certain notorious Hollywood executives. Both women faced unwanted pregnancies alone ... Mr. Rader...has done his research and he clearly has sympathy for his leading ladies. But in a dual biography, each moment has to illuminate the whole. Too often, here, the storytelling is cramped or flattened or sounds like a screenplay, which in fact, is how he originally conceived it. There is nothing new in Rader’s book that has not been covered by the many biographers of Bernhardt and Duse. His dual-biography structure allows him to highlight the ways their lives and careers both parallel and contrast. Rader has a breezy style that keeps the reader fascinated. Playing to the Gods is a useful entry into the careers and lives of these two extraordinary artists. What did you think of Playing to the Gods: Sarah Bernhardt, Eleonora Duse, and the Rivalry That Changed Acting Forever?